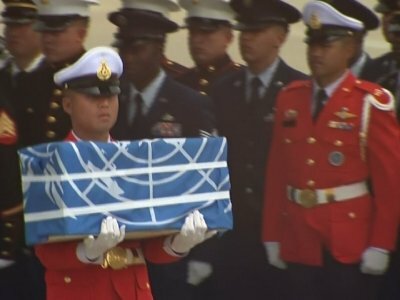 WASHINGTON (AP) — President Donald Trump thanked North Korean leader Kim Jong Un on Friday for “fulfilling a promise” to return the remains of U.S. soldiers missing from the Korean War, as a U.S. military plane made a rare trip into North Korea to retrieve 55 cases said to contain remains. North Korea’s move signals a positive step in Trump’s diplomacy with Pyongyang, and may restart efforts to send U.S. teams into the country to search for additional war dead. Defense Secretary Jim Mattis cautioned that the transfer of remains “is separate” from what has so far been troubled efforts to negotiate the complete denuclearization of North Korea. But he said it was a step in the right direction following the Trump-Kim summit in Singapore. Subsequent talks between U.S. Secretary of State Mike Pompeo and senior North Korean officials got off to a rocky start earlier this month, with the North accusing the Americans of making “unilateral and gangster-like” demands on denuclearization. On Wednesday, Pompeo said a great deal of work remains ahead of a North Korea denuclearization deal, but he declined to provide any timeline. “We have many others coming, but I want to thank Chairman Kim in front of the media for fulfilling a promise that he made to me, and I’m sure that he will continue to fulfill that promise as they search and search and search,” Trump said. “These incredible American heroes will soon lay at rest on sacred American soil,” he added. Mattis underscored that looming question, saying “we don’t know who’s in those boxes.” But he said the gesture is important for families of the fallen, which could include any of the allies that also fought in the war. The repatriation of remains could be followed by stronger North Korean demands for fast-tracked discussions to formally end the war, which was stopped with an armistice and not a peace treaty. South Korea’s Defense Ministry also said the North agreed to general-level military talks next week at a border village to discuss reducing tensions across the countries’ heavily armed border. Efforts to recover American war dead had been stalled for more than a decade because of a standoff over North Korea’s nuclear program and a previous U.S. claim that security arrangements for its personnel working in the North were insufficient. Washington has said Pyongyang wouldn’t get sanctions relief and significant security and economic rewards unless it firmly commits to a process of completely and verifiably eliminating its nuclear weapons. There are lingering doubts about whether Kim would ever agree to fully relinquish his nukes, which he may see as a stronger guarantee of survival than whatever security assurance the United States could offer.